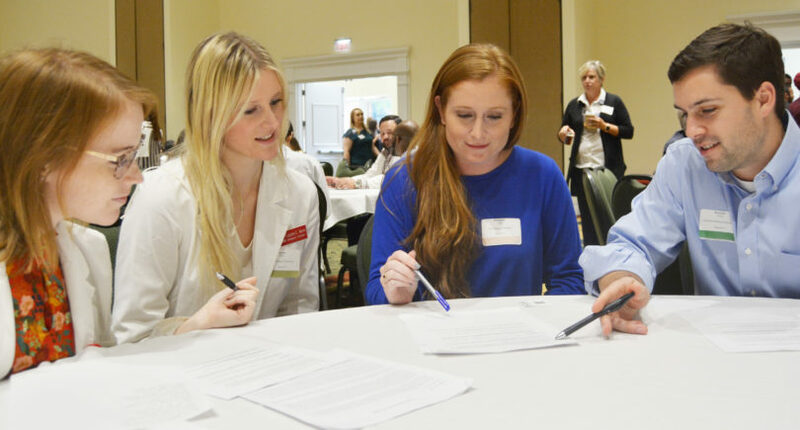 Brannon Hicks, a student in the Augusta University/University of Georgia Medical Partnership, right, discusses a patient treatment scenario with Emily Smith, a second-year pharmacy student from Alpharetta; Lauren Wynn, a second-year pharmacy student from Asheville, NC; and Elizabeth Lally, who is pursuing a doctorate to become a nurse practitioner at the Augusta University campus. Acing your courses might be a solitary activity, but keeping patients healthy isn’t something one person can do alone. That was the takeaway for pharmacy student Alfred Awuah and more than 250 students in three other disciplines who worked together Oct. 24 in an experiential learning scenario designed to foster interprofessional collaboration throughout their careers. The event, funded in part by the Georgia Learning Through Interprofessional Development Experience, or GLIDE, program in the Provost’s Office, was designed to mimic real-life interdisciplinary work and show students how to work together in a team to address an issue. It brought together students from four academic programs: the Augusta University/UGA Medical Partnership, College of Pharmacy, School of Social Work and the Augusta University College of Nursing, which has a campus in Athens. Susan Fagan, Distinguished Research Professor, Albert W. Jowdy Professor of Pharmacy Care and assistant dean in the College of Pharmacy, said she has dreamed of bringing students together for some time because she believes that teamwork can transform health care delivery. Coordinating among different schools and colleges, different campuses and even two universities wasn’t easy, but Fagan said that the support from the GLIDE program and the Provost’s Office helped make the collaboration possible. Brannon Hicks, a first-year medical student in the Augusta University/UGA Medical Partnership, said the event taught him a lot about other professions and how they can provide resources for patients that physicians can’t. Elizabeth Lally is pursuing a doctorate to become a nurse practitioner at the Augusta University campus in Athens while also working part time in the emergency department of St. Mary’s Hospital. She said that she has seen firsthand how patient care can improve when the entire team works well together. The health care exercise was the first to benefit from GLIDE program grant funding, but Russ Mumper, vice provost for academic affairs and chair of UGA’s interprofessional leadership committee, said he believes that the program will benefit students across campus.